iHerb English Language School of the English Project for a Better Life, is a core educational program for rural students, which is funded by iHerb Charitable Foundation. In March 2015, the iHerb English Language School was opened in Dar Primary School, Kampong Leng District, Kampong Chhnang Province. The aim of opening this project was due to the fact that students in the area had the limit access to English language programs. From March 2015 to September 18, 2018, 1,079 students have benefited from this development. Students who join the morning classes are fed with nutritious meals. Along with the English language program, free transportation for 72 high school students, whose houses are situated more than seven kilometers from high school, have been offered, and 25 students from vulnerable families have been engaged with Student Support Program. Impact Project Case Story, a Lesson Learned! The iHerb English Language School management team is pleased to share a story of Men Sophea, who is identified as an outstanding student of iHerb English Language School. Sophea is also one of the beneficiaries, who has been participating in the Student Support Program of the iHerb Charitable Foundation through the project. Messages in part of this story are quoted with verbal agreement from Sophea, her father, mother and teachers. Men Sophea is the oldest daughter of Moung Men (father) and Phloch Soeun (mother). She has three younger siblings, two of whom are primary school students. They are currently living in Kuy Village, Dar Commue, Kampong Leng District, Kampong Chhnang Province, center in Cambodia. The family condition is identified as the most vulnerable family (Poverty Category 1 - Dar Commune Council Certificate Poverty Category 1 ). On September 18, 2018, the project team consists of Social Worker/Administrator/ Finance Officer, Team Somnang and Finance Internal Controller, Sok Saro paid a visit to Sophea’s family. The team was able to join sharing sessions with her and her parents. When the team asked Sophea and her father about the English language program, she responded that “I am happy to be a student of the English Language School. When I grow up, I want to be an English Teacher.” “I bought a Khmer-English dictionary for my daughter (Sophea) so that she can translate English words to Khmer. I want her to be a teacher”, Men told the team. Sophea’s father is a seasonal worker, and he spends most of his time fishing for sale to earn income for the family. Sophea’s parents are satisfied with their children educational program. They wish to see their children have better lives. “Sophea became a student of the iHerb English Language School in Academic Year 2016-2017. As part of my observation, I noticed that her attitude was in good manner and showed high commitment to the educational program. She was always attending classes even though she had to ride her bike 6 kilometers from home to school regularly, and she was hardly ever absent. While attending classes, she paid much attention and focused on subjects. 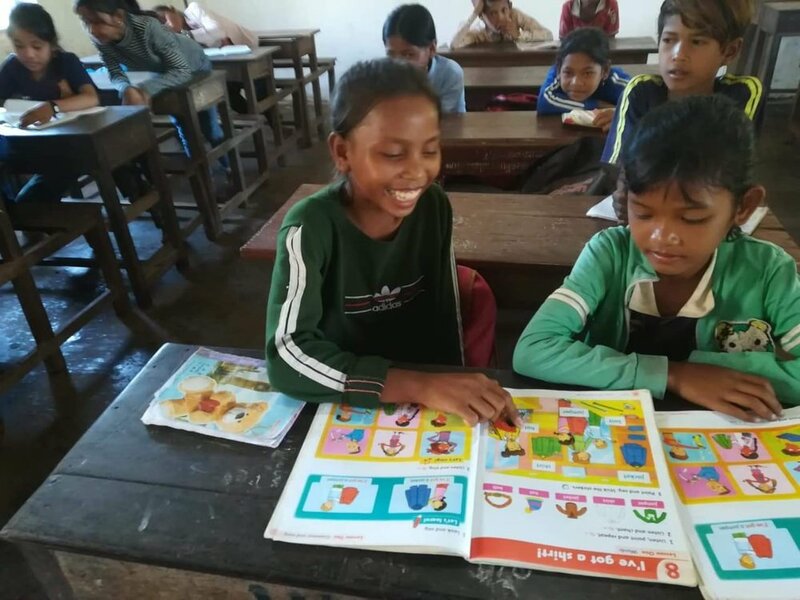 In addition, she was not a talkative student as she always concentrated on her studies.” Head Teacher, Loun Sopheara said. Sopheara was Sophea’s teacher during the Academic Year 2016-2017. “Based on the enrollment profile that I reviewed, I realized that Sophea is one of the students whose family is in Poverty Category 1, so I introduced her to the project management team so that she could be in the Student Support Program.” Sopheara added. Resulted from the assessment needs, on October 25, 2017, the project provided her with monthly assistance including 25 kgs of rice and 160,000KHR (US$40.00). It is to ensure that Sophea attends her educational program (English language and general subjects). 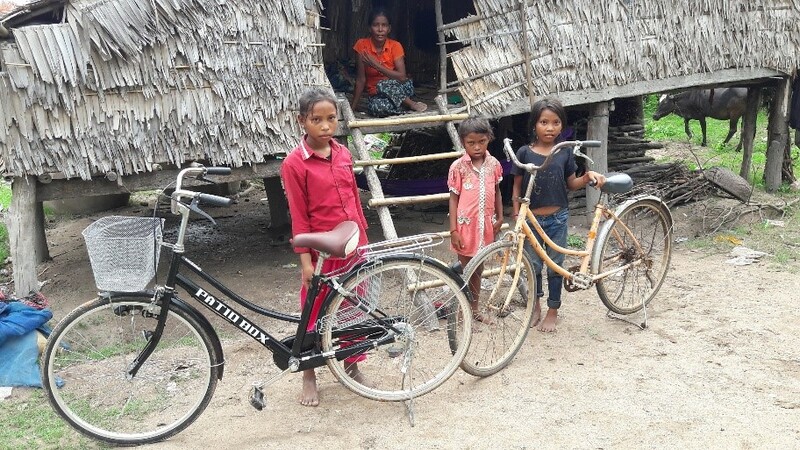 After several months, Sophea decided to buy another new bicycle and gave her previous one to her sisters. “I saved some amount of money that I received from the project team for purchasing another bicycle for my regular traveling to schools. I gave my first bicycle to my siblings for their traveling to school.” Sophea told the team. “Sophea is one of the most active students of iHerb English Language School. She usually gets her learning materials organized such as text books and a dictionary. She always keeps concentrated while attending the course. Sophea is good at reading and writing vocabulary while doing short tests. Hence, I can conclude that she has gained a better knowledge in this subject (English language) and is one of the outstanding students. I did the monitoring and found out that Sophea spent her time to assist her classmates, whom she identified as “slow learners”. The support her classmates got from Sophea included checking vocabulary as most of her classmates didn’t know how to use a dictionary. From my point of view, her knowledge improvement surely influences the funding partner (iHerb Charitable Foundation), teachers, parents and her classmates. I am proud to see that her knowledge has been improved, compared to the moment prior to attending the English Language Course, and I can see that all of my students keep learning rather than doing something not good.” said Thin Sok, an iHerb English Teacher teaching Sophea. The project team wishes to thank iHerb Charitable Foundation for supporting and fulfilling her needs. The team would like to take this opportunity to appreciate the efforts of Sopea, her parents, teachers, and communities. Story composed by Loun Sopheara and Thin Sok; Additional information supplied by Prak Ay and Team Samnang, and proofread and edited by Siemreap Translation Service. Photos supplied by Khem Sarmoeun and Hing Channarith. The images show Sophea, her family and project team at her house.